Randy Foye was born September 24, 1983. Randy’s father was killed in a motorcycle accident when he was a toddler and his mother abandoned the family three years later. Randy was raised by a circle of family and friends led by his grandmother. An older boy named ZeGale Kelliehan (Z, for short) became his basketball hero, and as he grew, he became one of the best young ballers on the city’s playgrounds. That Randy could even play ball was something of a medical miracle. He was born with a condition called situs inversus, which meant his internal organs were a complete reverse, mirror image of typical human anatomy. Many people with this condition only have some organs reversed, which leads to debilitating pain and sometimes death. Undaunted, Randy blossomed into a big-time player at East Side High. As a freshman he helped the Red Raiders reach the state semifinals. After the season, several players from Africa were suspended and the coach resigned. Randy was recruited by area provate schools but decided to stick it out with new coach. Bryant Garvin. The Red Raiders became one of the top teams in the region again and won a state championship in 2001–02 in Randy senior year. Randy accepted a scholarship from Villanova University, where he teamed with fellow guard Allen Ray to lead the Wildcats to the Sweet Sixtenn as juniors. Villanova won a share of the Big East championship as seniors in 2005–06. Randy was named Big East Player of the Year. Villanova scored narrow victories over Arizona and Boston College to reach the Elite Eight. They were upended by Florida in the final game of Randy’s college career. He averaged 15 points a game in four seasons, with a high of 20.5 in 2005–06, when he was also a First-Team All-American. Randy was selected by the Boston Celtics with the 7th pick in the 2006 NBA Draft. He was immediately shipped to the Portland Trailblazers in a deal for Theo Ratliff, and then swapped again, this time for the Minnesota Timberwolves’ Brandon Roy. Randy was the T-Wolves Sixth Man in 2006–07 and made the NBA All-Rookie First Team. He played all 82 games and averaged 10.1 points per game. Minnesota finished 32–50 and over the summer traded their star player, Kevin Garnett. Randy won a starting job in 2008–09—and set a team record for guards with16 rebounds in a game—but lost half the season to an injury. He came back a year later to finish second on the club in scoring and steals, and third in assists. 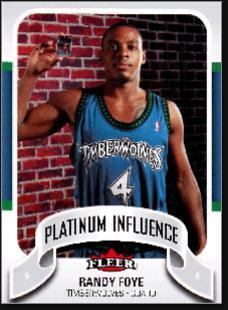 The T-Wolves were still a sub-.500 team and Randy was a valuable trading chip. He was shipped to the Washington Wizards in a multiplayer trade and played for the Wizards one year before becoming a free agent. The Clippers signed Randy in 2010 and he played two years in LA as a part-time starter. In 2011–12 he was among the league leaders in 3-pointers and got his first taste of playoff action. Randy signed a free agent deal with Jazz after the playoffs and returned to a starting role, averaging 10.8 points a game and was seventh in the NBA with 178 3-pointers. One year later, Randy found himself on the Denver Nuggets after a multi-team multi-player trade. He started next to Ty Lawson in the Denver backcourt and averaged his usual 10 points a game. Beginning in 2014–15, Randy assumed more of a Sixth Man role—for two years with Denver and later with Oklahoma and Brooklyn.